Total, which had a few weeks back exited Royal Dutch Shell-led Hazira LNG import terminal in Gujarat, will join Adani in developing a 5 million tonnes a year import facility at Dhamra in Odisha. The two will also set up a joint venture to roll out a fuel retail network of 1,500 outlets, mostly on highways, in the next 10 years, Adani and Total said in a joint statement. India's largest infrastructure conglomerate Adani group and French energy giant Total SA Wednesday announced a partnership to develop liquefied natural gas (LNG) import terminals and fuel retailing network in India. While the two firms did not indicate details of the deal, including how much stake Total was picking up, sources privy to the development said the agreement signed was a preliminary collaboration pact and details would be announced later. Also, Total is eyeing a stake in city gas distribution projects of Adani but talks are stuck on valuation. "Adani and Total have signed an agreement to jointly develop multi-energy offerings to the Indian energy market. The diversified portfolio includes LNG and fuel retail," the statement said. Total, the world’s second-largest LNG private player, and the USD 11 billion Adani group, which has interests in energy, infrastructure, ports and edible oil, "will serve the fast-growing gas demand of the Indian market," it said. "The partnership has set a target of developing various regasification terminals including Dhamra LNG on the east coast of India," it added. "Most essentially, it would be a big stride towards India's vision of achieving a healthier energy mix through the promotion of LNG." Also, Total and Adani will create a joint venture to build a retail network of 1,500 service stations over the period of 10 years, on the main roads of the country such as highways and intercity connections to take advantage of a market that is growing at 4 per cent per year driven by the development of road infrastructures and the emergence of middle class. "These new service stations, in line with international standards, will offer Indian customers Total's full lineup of fuels, lubricants, as well as a broad range of other products and services," the statement said. Adani holds a 25 per cent stake in just-completed 5 million tonnes a year liquefied natural gas (LNG) import terminal at Mundra in Gujarat. It is also building a similar capacity LNG import terminal at Dhamra in Odisha at a cost of Rs 5,100 crore by 2021. Sources said Total may take buy some of Adani's stake in the two terminals. It is also looking at buying a 50 per cent stake in under-construction LPG import terminal that Adani is building at Mundra in Gujarat as well as a stake in Adani's flourishing city gas distribution projects. While the Mundra LNG terminal has Gujarat State Petroleum Corp as the lead partner, Adani is building a new LPG import facility at the same port with a total capacity to 3.56 million tonnes per annum. The LPG terminal is to be completed by next month. Total chairman and CEO Patrick Pouyanne had on Tuesday stated that the French company is "very interested" in investing in downstream sectors in India, including LNG terminals. "City gas is interesting business" that can use the imported LNG, he had said without giving details. He had stated that Total does not qualify for a license to retail petrol and diesel in the country as it does not meet the Rs 2,000 crore minimum investment threshold set for such a permit. But with Adani, which has already invested many times more than that amount in oil and gas infrastructure, it will qualify for a retail license. India is looking at more than doubling the share of natural gas in its energy basket to 15 per cent in the next few years and is giving a major push to city gas distribution projects. It imports half of its gas needs, which are projected to rise exponentially as it shifts from polluting liquid fuels to environment-friendly natural gas. 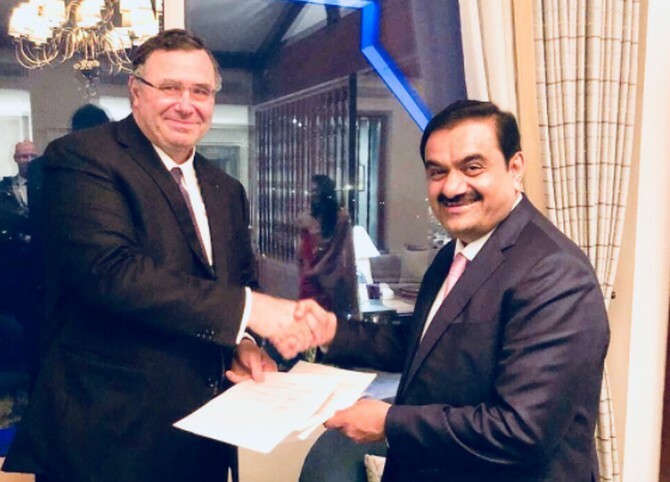 On signing of the agreement with Total, Adani Group Chairman Gautam Adani said: "The collaboration enables us to associate with Total's century-old legacy, global presence, scale and unparalleled go-to-market expertise. The global synergy between the two groups presents widespread benefits and long-term value for the economy and the people of India". Stating that the pact would enable Adani Group to be part of the country's vision in adopting cleaner energy, he said the partnership would touch millions of lives by leveraging collective footprints and domain expertise in the energy sector.